Well, it’s been to the headlines and back by now, and anyone familiar with how baseball works would know that there was no chance in the world that this was going to stay quiet until the formalities were taken care of. So let’s talk about it. We just sent most of our core to the Dodgers, in keeping with their doubling as the Los Angeles Blue Sox. And when I say that it was most of our core, I mean that literally. Adrian Gonzalez, Josh Beckett, Carl Crawford, and Nick Punto. They all involved waivers. All but one of those were starters for us, and Punto did see more than his fair share of playing time as a utility man off the bench. In return, we will receive four prospects (right-hander Allen Webster, infielder Ryan De Jesus, and two more to be named), a first baseman (Jason Loney), and financial flexibility. There is no question about the fact that this is one of the largest waiver deals ever and certainly the largest in recent baseball history. Obviously this is a huge deal, both literally and figuratively. Beckett has obviously struggled this year, as have Crawford and Gonzalez and Punto, although much less than Beckett. So if Ben wanted to make some sort of wave by getting rid of somebody big, he could have just gotten rid of Beckett and have been done with it. That would have been the obvious action, if there were one at all. But to ship out all four of these guys, especially Gonzalez? Was that really necessary? Regardless of who these prospects might be and what this flexibility might look like, is this really the best thing for our future? Or is it a short-term quick fix to show the Nation that the brass is at least doing something and that this really was a bridge year? Furthermore, does this mean that the brass has sided with Bobby V. rather than the players regarding the issue of his managerial style, or does this have nothing to do with that at all because it’s based strictly on performance, or lack thereof? But if it does have to do with that, how certain are the brass that the solution indeed involved the players rather than the manager and coaches? Punto finishes his lone season with us, which wasn’t even a whole season, with a batting average of .200, an on-base percentage of .301, and a slugging percentage of .272. He has had 125 at-bats in sixty-five games; he has twenty-five hits to his credit as well as ten RBIs and fourteen runs. He has walked nineteen times and stolen five bases. He has played every infield position this year and has made only two errors. Crawford departs after having played almost two season here. Last season was better in terms of playing time, while this season was better in terms of performance. He finishes this season with us with a batting average of .282, an on-base percentage of .306, and a slugging percentage of .479. He has had 117 at-bats in thirty-one games; he has thirty-three hits to his credit as well as nineteen RBIs and twenty-three runs. He has walked three times and stolen five bases. He has made only one error in the field. Gonzalez also departs after having played almost two seasons here, but it feels like so much more because he has so easily become a fixture on this team. He historically has been known for his great leadership and team presence, both in the clubhouse and on the field. He always seemed to be really enthusiastic about playing here, and he usually let his production do the talking. And it talked a lot. His average last year was a cool .338, and it was hard to imagine him not getting up there and whacking some ball for extra bases every time. He certainly did struggle at the beginning of the season but has since started to bounce back quite nicely. His average is now at .300, and he has an on-base percentage of .343 and slugging percentage of .469. He’s had 484 at-bats in 123 games; he has 145 hits to his credit as well as eighty-six RBIs and sixty-three runs. He has walked thirty-one times and stolen no bases, but that’s alright because his job, unlike Crawford’s, is not even partially to steal bases. His job is to hit for extra bases, and that he can do. He hasn’t hit any triples, but he’s hit thirty-seven doubles and fifteen home runs. And in addition to first base he has also played right field this year because he’s a team player, and when the team needed him, he didn’t ask questions; he just slid right in there, and he did an impressive job at that. He made four errors this year, two in right and two at first. Beckett, of course, is the most storied of the four. He’s certainly been here the longest, so he’s given us more memories, some good and some bad but all unique. He came here in 2006 and had a subpar season. In 2007 he went twenty and seven, and everyone but those in the position to award the Cy Young knew that he was the one who deserved it, regardless of the fact that he was a huge reason why we won the World Series that year. His start in Game One was phenomenal. It was a real gem. He retired nine batters, including his first four, and gave up only one run. 2008 was another mediocre year, but 2009 saw him largely back to his old self, finishing the season with a record of seventeen and six. 2010 was an abysmal year, and of course last year was decent; his record was thirteen and seven, so he won almost twice as many games as he lost. And then we have this year. This year he’s five and eleven with a 5.23 ERA and a 1.33 WHIP. He’s pitched 127.1 innings and given up seventy-four earned runs on 131 hits, sixteen of which were home runs; incidentally, he’s only allowed one unearned run. He has given up thirty-eight walks as well. So, in the grand scheme of things, it’s not like every single season he’s been here except for this one has been an unabashed success. Far from it. But when he’s been successful, he’s been really, really, really successful. And of course there’s his personality. Rumor had it that he was partly if not completely responsible for the deterioration of our clubhouse and has been widely associated with the instigation of beer-drinking and whatnot within it. As I said at the time when all of this was news, none of us were actually there, and we can’t know what really went on. All we know is that, despite his mile-wide competitive streak and work ethic, Beckett has not been performing well at all on the mound. On the eve of the departures of these players, we salute their commitment to this team and the accomplishments that they achieved during their stay here. In the spirit of the tribute, therefore, Punto, Crawford, and of course Gonzalez as well as Beckett, we’ll miss you and we salute you. Now, as far as the implications of the deal and what it all means, there are things I said and there are things I didn’t necessarily overtly say. But in reality I said a lot. Ultimately, our task now is to see what we end up doing during our offseason. We lost to the Royals in extras last night, but it really wasn’t Cook’s fault. Cook, for his part, did an extremely admirable job, especially when you consider the fact that he made this start on three days’ rest. He gave up three runs on seven hits while walking one and striking out none over six innings. He gave up all three runs in the first thanks to a double that brought in two and then a single that brought in one. He then cruised for the remainder of his outing. Meanwhile, our hitters put us on top. The Royals may have scored three runs, but we answered with four in the second. Gomez hit a solo shot, the first homer of his Major League career, and then Salty and Lavarnway hit back-to-back singles to set the table for Aviles, who went yard on the first pitch he saw, sending the ball out toward the Monster. And the third inning only served to solidify the fact that we were in control. Pedroia doubled, Ellsbury walked, and Ross singled to load the bases; thanks to a single by Gomez as well as a Royals error, we scored another two runs plus a third thanks to a sac fly by Salty. We just kept piling it on in the fourth; Ciriaco walked, and Ellsbury singled two outs later. Ross and Gomez added their consecutive singles to Ellsbury’s to go back-to-back-to-back and plate two more runs. So by the time Cook’s appearance came to an end, we were leading, 9-3. And I have to say, I was feeling pretty comfortable with how I expected this game to turn out. I mean, we just scored nine runs, and we did it with everything: long ball, small ball; you name it, we did it. And we had a six-run lead to boot. But I should have expected that no lead would possibly have been safe. Because then the seventh inning happened, and the seventh inning was when our entire relief corps ruined it completely, imploded totally, and embodied the epitome of an epic fail. First, it was Miller, who allowed a groundout, a single, a strikeout, two consecutive walks, and an RBI single that scored two. Then Melancon came on and gave up an RBI double and an RBI single. Then Breslow came on and gave up a triple that scored two and then managed to finish the inning with an intentional walk followed by a groundout. Breslow pitched the eighth, Bailey pitched the ninth, Padilla pitched the tenth, and Tazawa pitched the eleventh and most of the twelfth. He gave up a walk, a double, and finally the single that scored the winning run. Mortensen replaced him after that and ended the inning. And we threatened a bit in the eighth, when Ellsbury got himself to third with two out, and in the tenth, when Ciriaco was thrown out at home. But we didn’t score since the fourth, so we allowed our lead to be completely squandered and lost, 10-9, even though we outhit them, 20-14. And as an added reflection of the badness of our entire situation, Aceves reportedly slammed the door on his way into Bobby V.’s office after Friday’s game and has been suspended for three games for conduct detrimental to the team. On June 12, we beat the Marlins, 2-1, in an obviously close game. Buchholz was a big part of that; he pitched seven innings and gave up only one run on five hits, while walking one and striking out two. One of those five hits was a solo shot in the seventh. Padilla received a hold for the seventh, and Aceves got the save in the ninth. We scored both of our runs via small ball in the seventh; Youk grounded out, Middlebrooks singled, Gonzalez flied out, Shoppach doubled in Middlebrooks, and Aviles singled in Shoppach. We completed our series against the Marlins with a win as lopsided as that one was close, winning by a final score of 10-2. Doubront delivered unquestionably his best start of the season, pitching a full seven innings and giving up two runs on three hits while walking one and striking out nine. One of those three hits was a solo shot with two out in the sixth. Padilla, Miller, and Albers combined to pitch the rest of the game. And our hits were really busy; Aviles scored on a groundout in the third, Papi homered in the fourth, three consecutive singles and a sac fly in the sixth yielded two more, and we put up a six-spot in the eighth, when we sent eleven batters to the plate! Punto doubled, four straight singles yielded three runs, Middlebrooks got hit, Salty scored another with a sac fly, Sweeney lined out, and two straight singles scored our last run. On June15, we started our series against the Cubs, and I am both relieved and pleased to say that Dice-K had himself a phenomenal start! He pitched six innings and gave up three runs on four hits while walking three and striking out three. He threw ninety-three pitches, sixty-two of which were strikes. Atchison and Melancon finished the game on the mound. But we were shut out and lost, 3-0. We had better luck in the next game, which we won, 4-3. Lester went six and two-thirds innings and allowed three runs on seven hits while walking one and striking out eight; he gave up a two-run shot with one out in the seventh. Salty homered with Papi on in the fourth, Middlebrooks singled in another run in the sixth, and then Podsednik singled in our final run in the seventh. We ended up winning the rubber game by a final score of 7-4. Beckett was out with inflammation in his right shoulder, so all those times I called for the bullpen to start rather than the starter finally paid off. Morales pitched five innings and gave up two runs on four hits while walking none and striking out five; all in all, I’d say he was spectacular given the circumstances, including the fact that it was his first start since 2009. He threw eighty pitches. Albers then received a blown save for giving up the tying run; Miller, Melancon, and Atchison held the fort until Aceves allowed a run in the ninth. In the first, Pedroia doubled and Papi singled for two, Papi led off the fourth with a solo shot, we scored three in the seventh on a single and two sacrifices, and we scored one in the eighth on a force out. We played the Marlins again starting on Monday, this time at home, and this time we swept them. The first game’s score was 7-5; Buchholz gave up five runs on nine hits while walking one and striking out three. Albers, Miller, and Padilla performed well in middle relief, and Aceves picked up the save. Papi hit a two-run shot in the first, Shoppach hit a two-run shot in the second, Ross hit a solo shot in the fourth, Gonzalez hit a sac fly in the fifth, and Middlebrooks doubled another in in the sixth. The second game was a 15-5 blowout. Doubront gave up four runs on nine hits while walking one and striking out four; Mortensen gave up one run, and Melancon pitched a shutout inning. Aviles hit a three-run shot in the second to start the scoring. Ross hit a bases-loaded, bases-clearing double in the third for three more runs. We blew it wide open in the fourth; Kalish singled in one, Papi smacked a grand slam, and Salty hit a solo shot! Punto scored on a wild pitch in the fifth, and Middlebrooks hit a two-run shot in the eighth. We barely won a nailbiter to complete the sweep. Dice-K gave up four runs on four hits over five and a third innings; he walked one and struck out four. Miller gave up one run, and it was Atchison who picked up the win and Aceves the save. We got on the board in the fourth when a single and a sac fly brought in two, and we tied it up in the fifth with a single. Then they led by two until the eighth, when Middlebrooks hit a two-run shot and Nava singled in a third run. After Aceves’s performance, we had the sweep in hand. After the Marlins, we hosted the Braves. We lost on Friday, 4-1, but it wasn’t for lack of starting pitching. Lester pitched seven innings and gave up three runs on ten hits while walking one and striking out five. This time it was Melancon who allowed a run while Mortensen recorded the game’s last out successfully. We scored our only run in the eighth on a double by Nava. We won on Saturday, 8-4; Morales started again and was fantastic. He gave up three runs, two earned, on seven hits over six innings while walking one and striking out eight; he threw eighty-six pitches. Atchison, Miller, Padilla, and Aceves all appeared in relief. Gonzalez singled in one and Middlebrooks doubled in another in the first, Pedroia doubled in two in the second, Middlebrooks homered in the third, Ross doubled in another in the fifth, and Nava singled in two in the seventh. We ended up winning the series yesterday with a final score of 9-4. Cook started in place of Buchholz, who was hospitalized due to a gastrointestinal problem. Cook gave up three runs, two earned, on six hits over five innings. He walked none and struck out none. Albers allowed another run in relief; other than that, Miller, Atchison, and Melancon performed well and took care of the rest of the game. Ross hit a three-run shot in the fourth, followed by a solo shot by Gonzalez. Middlebrooks brought another one in with a sac fly in the fifth, followed by another home run by Ross, this one for two runs. Nava doubled in another run in the sixth, and Youk tripled in our final run in the seventh. It turned out that that run would be the last that Youk would bring home and third base would be the last base that Youk would defend and that game would be the last that Youk would play in a Boston uniform. He was traded yesterday with cash to cover the remainder of this year’s salary before that at-bat to the Other Sox for utility man Brent Lillibridge and right-hander Zach Stewart, who the team has been scouting apparently since his college days. Even before the at-bat, the crowd knew it was probably their last time seeing this phenomenal player playing for them; they had already given him a well-deserved standing ovation before his first at-bat in the second, and Youk had already returned it with a tip of his helmet. In classic dirt-dog fashion, Youk legged out that triple, admittedly with a little help from the Braves, and went into the slide, and the standing ovation that he received afterwards was huge, thunderous, and extremely well-deserved. Punto came out to pinch-run, since Ben didn’t want him injured, and after an emotional hug, as the two have been friends for years and years through Athletes Performance in Arizona, Youk returned to the dugout. He tipped his helmet and was greeted by everyone at the entrance for more hugs and then emerged for a curtain call for both the crowd and his teammates, initiated by none other than Big Papi himself. On the day, Youk went two for four with the triple and the one RBI. Obviously, he also walked once and was involved in a controversial defensive play in the third during which there was some concern that he may have sustained an injury but flashed his characteristic leather throughout. Also obviously though, there is more to a player than his final at-bat for a ballclub. Youk was more to us than a triple and some good plays at third. We picked him in the eighth round of the First-Year Player Draft in 2001 and raised him ourselves on the farm, and his first year in the Majors culminated in a World Series ring, our first in eighty-six years; with this trade, Papi is now the only member of that team still playing for us today. Three years later, he added another in 2007. He finishes his career in Boston with a batting average of .287, an on-base percentage of .388, 728 strikeouts, twenty-six stolen bases in forty attempts, and 961 hits. Of those, 239 were doubles, seventeen were triples, and 133 were homers. He batted in 564 runs and scored 594. He played in 953 games and accumulated 3,352 at-bats. 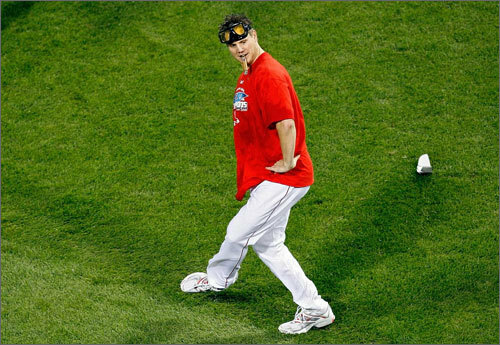 Last but not least offensively, two of the stats for which he is most renowned throughout Major League Baseball, he walked 494 times and was hit by eighty-six pitches. Now that’s a combination of eyes and patience if I’ve ever seen it. In addition to his offense, the second aspect to Youk’s incredible game as his fielding, and this was where his versatility really shone. Youk was a fixture at the corners. Both of them. It is fitting that he ended his Boston career at the bag where he began it, but he will be remembered as someone who routinely crossed the diamond without a word or a hiccup. His fielding percentage at third in 362 games and 320 starts is .966; his fielding percentage at first in 594 games and 546 starts is .997. In his career thus far, he has also played second base, left field, and right field and has made 986 assists, 4,788 putouts, and only forty-four errors. There are all sorts of comparisons to be made between his stats and those of other greats the game has seen, but he was such a unique player that he shines in his own right, which brings me to the third and final aspect of Youk’s game, which was his character and leadership off the field. As is the case so often for veterans who have played here, he was an extremely classy player. He gave everything he had for every single at-bat at the plate and every single play in the field; he was completely invested in the well-being of the team, as evidenced by his visible and often physical expressions of frustration at his recent lack of production. Every extra-base hit he legged out, every diving play he made, every walk he worked, and every batting helmet he threw were all the result of a fierce desire to see this team succeed. He was a terrific mentor to the younger guys, including his replacement even as he was conscious of the fact that he was being replaced, and had a fierce, determined, and committed will. He earned every All-Star vote he ever received and represented us three times as someone who really embodied the spirit of what it means to play here. He was committed to his teammates as well, as evidenced in their extremely heartfelt goodbyes. Pedroia said he loves the guy, as do well all. We all knew this was coming. Youk was being sidelined by Middlebrooks constantly, and the lineup was all convoluted to try to fit him in, and he didn’t exactly get along with Bobby V., and the rumors were steady. But putting all of that aside, it speaks volumes about the type of player but also the type of guy that Youk was that after a big win that gave us the best record we’ve had all year, the mood in the clubhouse was sad, somber, and serious. Youk helped us win two World Series championships and gave his all to this team, this city, and this game. To say that he will be missed is an extreme understatement. 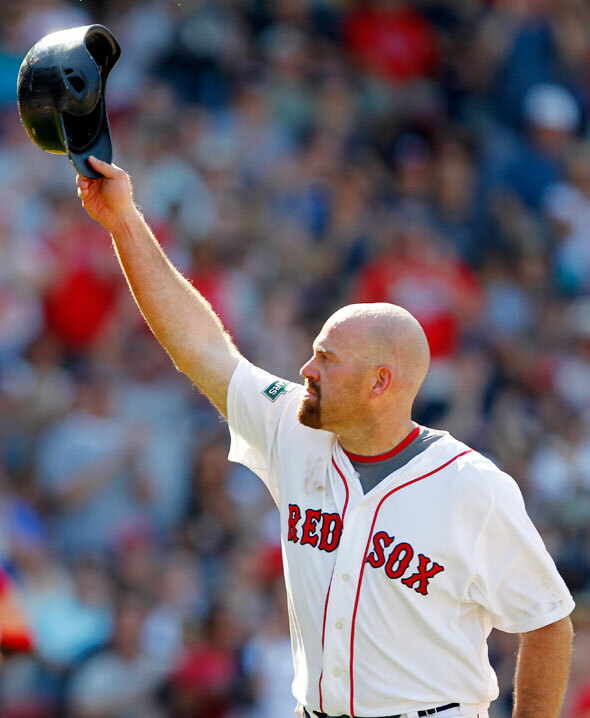 Youk, we salute you. Even this late in the game (pun intended), we’ve got more goodbyes to say. 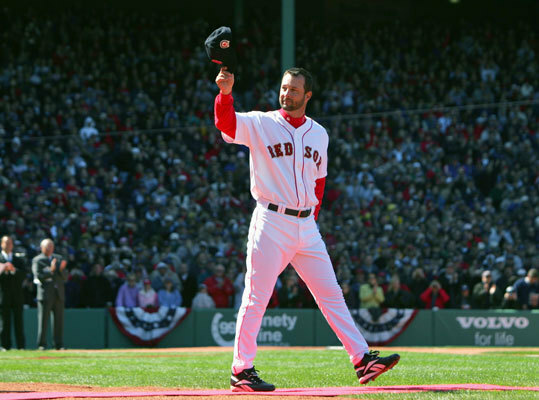 This time, we’ve got to say goodbye to someone who’s been there for most of everything that’s happened in our most recent baseball memory: Tim Wakefield, who retired on Friday at Spring Training. Here’s the tribute. Obviously I’m one of the world’s biggest sabermetrics fans, but even with sabermetrics, it’s hard to determine how a signing will turn out, and of course it was even harder to do so before baseball professionals saw its light. After what Wake has given us, it’s hard to believe that we picked him up in 1995 after he was released from a team like the Pittsburgh Pirates, who drafted him in 1988 as a first baseman, if you can believe it. At the time, the signing was a low-risk move, and I doubt that anyone had the foresight to predict what would happen next. In 1995, his first season with us, he won all but one of his decisions, and thus began one of the best relationships between a pitcher and a team in a long, long time. He’s played all but two of his Major League seasons with us; his career spans nineteen years old, and he retires at the age of forty-five. It’s hard to come by anyone else who embodies the term “veteran” so completely. He has started 463 games and pitched in 627. He has hurled 3,226.2 innings. Those start and inning totals are the highest of any pitcher in club history. He finishes his career with a 4.41 ERA, a 1.35 WHIP, and finally, both literally and figuratively as we all know, two hundred wins. His two hundredth win was the last game he will ever have played: September 13, 2011 at home. His 186 wins in a Boston uniform leave him seven shy of breaking the club record, currently held by both Roger Clemens and Cy Young. But that’s what’s special about a guy like Wake. He, like Mike Lowell, is the utmost of class and professionalism. Seven wins and breaking the record mattered less to him than bowing out gracefully when his time had come. To me, that demonstrates a heightened sense of self-awareness and self-security with what he accomplished. He feels happy about what he’s done and who he has become; for him, baseball was both a game and a career. And I think the club handled this one wisely. The front office didn’t offer him a contract but also wouldn’t allow a pitcher of his standing and status to compete for a spot during Spring Training like some untested kid. More than that, he was as active off the field as he was on the field. On the field, his skills were always apparent; even on his bad days, you know the next time out he’d have a good day. His knuckleball was second to none; he was a specialist to the utmost and executed his pitch as surgically as he could possibly have executed it (which doesn’t say much, since most of the mechanics of the knuckleball must be left up to chance, but still, if anyone could execute it surgically, he could). He was a competitor, a leader, and a rock who always did what was best for the team, including moving to the bullpen when it became clear that the sun had set on his role as a regular starter. And he took that in stride, and it says something that that was his attitude under five different managers. His dependability and versatility in terms of his role made him absolutely invaluable throughout even the last moments of his career, and it’s rare to be able to make that statement. It’s unclear whether anybody else in his position would have been able to do the same. He was also a rock in the clubhouse who, at all times, exhibited sportsmanship, leadership, and friendship, but he was also a fixture in charity work in the Boston area and made a real difference in the lives of the less fortunate. Nobody deserved the 2010 Roberto Clemente Award more than he did. And of course we can’t forget what he gave to this city in October. One of the lowest points of my entire baseball life was Game Seven of the 2003 ALCS when Wake gave up the you-know-what to you-know-who. But he bounced all the way back during the following season and, as we know, carried that momentum right through to the finish. We were losing Game Three of the 2004 ALCS, but if Wake hadn’t sacrificed his start during the following game by volunteering to take the mound in relief in order to preserve the bullpen, who knows what would have happened? We might still be without a championship, for all we know. And that right there, that nondescript simple act in which there was nothing for Wake himself, exemplified what kind of a teammate and a man he really was. Then of course those three shutout innings he delivered in Game Five were simply crucial; he won that fourteen-inning epic saga of a contest as a result. And when we won the World Series three years later, Wake had himself seventeen wins that season and became an All-Star for the first time two years after that. I just think the time is now. I never wanted to pitch for another team. I always said that I wanted to retire a Red Sox, and today I’m able to do that. Rare indeed in this day and age of the game is the ballplayer who possesses any sort of special attachment to a particular team that is so deep that he’ll make a statement like this. So here’s to you, Wake. We doff our caps to you like you’ve done to us so many times over the years. Here’s to the elation and grief that your knuckleball has caused, and here’s to what you’ve accomplished over the many years of your venerable career. Here’s to the fact that you were happiest when you were playing here, in this city, for us. We’ll never forget what you’ve done for us and for your team. You’ll most certainly be missed, but the strength of your character shows even in the manner of your retirement. So here’s to you. Congratulations! Wow. Talk about close calls. That, my friends, was a close call. That was a really close call. Hours before the arbitration hearing was scheduled to take place on Monday, Papi signed a one-year deal worth $14.575 million. That figure is halfway between what he wanted and what we originally offered, and it’s still a raise up from the $12.5 million he earned last season. And it’s still the highest salary ever intended for a DH. It’s a fair deal. He gets a raise, and we maintain our flexibility. Plus, anytime you avoid arbitration, it’s automatically a win-win. We avoided the mudslinging that was sure to come from both sides and, as Ben said, it’s better in the long run to have just resolved it. The no-arbitration streak continues since 2002. Beckett and Buchholz have reported; today is officially Pitchers and Catchers. As is the case with any good, dedicated team that expects itself to vie seriously for a title, by the time Pitchers and Catchers has rolled around, most of the pitchers and catchers are already down there. For everyone who’s down there, this year’s Spring Training is going to be a bucket of cold water. Bobby V. is a demanding guy who doesn’t take no for an answer. His regimens are strict. He wants to lengthen some games and add others to the schedule. It could be what the team needs, or it could be badness. As always with the changes expected of Bobby V., we’ll see. Crawford is expected to miss the first few weeks of the regular season as his recovery from wrist surgery continues. In other news, the B’s lost to the Rangers and Jets but squeaked by the Habs in a 4-3 close one. These are things that Theo has said: he wants to keep Papi and Paps and fix Lackey and Crawford. And he doesn’t blame Tito for the fact that we have suffered the completely devastating indignity of being the first team ever in the history of Major League Baseball to be eliminated from the playoffs after having held a nine-game lead in September. He blames himself and a lack of chemistry and conditioning. Apparently, Tito was concerned as early as the first week or so of September, so he called a team meeting to get everyone back on track. Since Tito’s assumption of the managerial role for us, these meetings have been gold. They’ve been a surefire way of airing grievances, getting things out of your system, identifying best and worst practices, and going from there to ensure a long-term strategy for success for the rest of the season, whether we had four months or four weeks left to play. Theo even came in to address the team; whether it was appropriate for him as general manager to do isn’t the point. The point is that desperation apparently was realized early, and everyone wanted to do what they could to fix it. According to Theo, some players were better conditioned than others, and this inconsistency manifested itself on the field. Regarding the chemistry issue, during the seasons when we went the deepest into the postseason (that would be 2003, 2004, and 2007), the team was apparently tighter, more familial, and more brotherly than it was this year. There wasn’t as much back-having and protection-securing in the field. Was it a problem when Lackey got visibly annoyed in public when a play wasn’t made behind him? Did Crawford’s handling of his gigantic slump affect the team behind closed doors? Was the clubhouse annoyed when Papi went after that scorekeeper for one RBI? Has Paps been going on and on about the fact that he wants a raise? Are all of the reports of prima donna behavior, like drinking beer between starts, true? And was it really Beckett of all people? I don’t know, and there’s no way anyone outside the room would know. What I do know is that these issues probably weren’t the only incidence of their type over the course of a 162-game season and that, when you’re spending that much time on planes, clubhouses, dugouts, and other tight spaces for that amount of time, brothers tend to get on each others’ nerves. However, at the end of the day, brothers are still supposed to be brothers, and they’re still supposed to act like brothers. It’s a problem when they don’t. Now here’s what Theo didn’t say, and this is huge. Of all the outcomes of this complete and total fail of a season, I never thought that this would be one of them. We had to find out from Ken Rosenthal on FOXSports.com that this may have been Tito’s last season as our manager. It turns out that he was right. It was a mutual thing; Tito doesn’t want to continue managing the team, and the team doesn’t want to pick up his option for next season either. What can I say? He is, without question, one of the best managers this club has ever had in its long and illustrious history. We failed to win a World Series in eighty-six years because we were cursed and because we were managed badly. All of a sudden, Tito came in and we won two in less than five years, our first in his first season with us. And in both of them, he brought us back from the brink of elimination. He’s the first manager in history to win his first six World Series contests. But it’s not just about that. It’s also his ability to be a good manager and to mediate forces in the clubhouse. He has a calming effect on even the most flamboyant personalities, and he handles the environment with a degree of respect, fairness, humor, and adaptation that is a truly rare combination indeed. We didn’t make the playoffs in 2010 because of injuries. We didn’t make the playoffs this year for reasons completely different that are highly speculative and have yet to be determined definitively. It’s completely unclear, as Theo said, that our collapse this September was Tito’s fault. He managed Michael Jordan to Manny Ramirez to everyone in between; I have implicit faith in his ability to maintain a positive and constructive clubhouse dynamic, and I have no reason to believe that the collapse occurred because he failed to do what was necessary. According to Tito, he did what was necessary; he was the one who reached out and called that meeting. It just wasn’t working. He wasn’t able to get through to these guys like he was able to get through to teams past. It’s not like he wasn’t trying. It’s just like the conditioning issue: you can tell a guy fifty times an hour to get himself into the weight room and work out, but at the end of the day, he’s the one who decides whether he gets himself into the weight room. There is only so much that a manager can do to stem the tide of slackening conditioning regimens and negative evolution of clubhouse chemistry. Obviously we weren’t going to hear about any of this, or the fact that he felt that support was lacking from ownership, until now. Regarding that last point, you can either believe that or interpret it to mean that it wasn’t a mutual decision and that it was the team who decided that it didn’t have enough support from Tito. Maybe Tito wasn’t enough of a numbers or data man, and that didn’t satisfy the brass. It’s not like anyone was going to start letting these things slip into the media in the middle of the season, and it’s not like we’ll know the whole truth of it, either. According to Jerry Remy, for those on the inside, it was pretty easy to see where this was going. Since 2011 is Tito’s last season with us, it’s extremely unfortunate that that’s how he’ll go out. He’ll finish with a record in Boston of 744 and 552. That’s a winning percentage of .574. He broke the Curse of the Bambino and led us to two World Series championships in which we were all but finished before we got there but, once we did, dominated completely. He’s been serious, and he’s been funny. He’s been human, and he’s been superhuman. He essentially made us the team of the decade, and he did so with a level of class and understanding of the game that this town hasn’t seen in a long time. For every managerial mistake he’s made, I’ve seen at least five manifestations of remarkable managerial acumen that everyone who’s ever won Manager of the Year would be hard-pressed to exhibit. 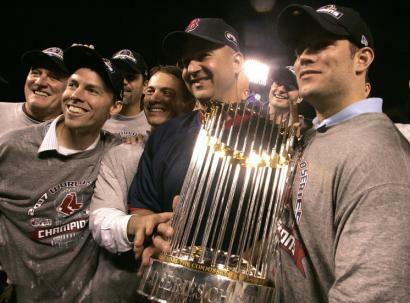 Speaking of which, I don’t care what anyone says; Tito was the 2010 American League Manager of the Year in my book. So here’s to you, Tito. You gave us your all, all the time. That’s not easy here, and we appreciate everything you’ve done to make this team a success. And we hope you’ve had as much of a complete and total blast here as we have with you at the helm. You acquired our instinctive faith, trust, and support, and we’re glad we were able to benefit from your talent. Tito, it’s been most phenomenal. And you will most certainly be missed. All rumors point to the Other Sox. Incidentally, this is something I better not hear anyone say: Tito intends to take a job with the Cubs and, oh, look, a few weeks later, so does Theo. And I don’t even want to think about what it’s going to be like seeing him in the visitor’s dugout at Fenway or the home dugout somewhere else. This one, I obviously saw coming. Seeing Beckett start after Lackey is sometimes really funny. You have a model of consistency following a guy who’s become in Dice-K’s absence the model of inconsistency on this team. Beckett is back to his old self again. You see him going out there, and you know the team is going to win. Beckett made quick work of the Mariners, but his hit count and pitch count were a little high. In seven innings, he allowed one walk and one run on one solo shot. It actually led off his last inning; it was a cutter, and it was the only mistake he made all night. It was a full count, and Tek wanted the cutter away, but it went inside. He struck out seven. He allowed seven hits on 118 pitches, eighty-one of which were strikes. That means that about sixty-nine of his pitches were strikes. That’s ridiculously high. So the high pitch count doesn’t bother me as much since the ratio of strikes to pitches is the same. Also worth noting is that, aside from the home run, he gave up only one other extra-base hit: a double. The rest were singles. His only pitch that wasn’t totally amazing was his curveball, and he still threw it for strikes a little more than half the time. Both of his fastballs as well as his cutter were indeed totally amazing. His best pitch was his changeup. About three quarters of the changeups he threw were strikes. Let’s break down his strikeouts. His first one came in the first inning on a cutter. His second ended the second inning on a changeup. His third was one-two-three; he didn’t post any K’s but induced three consecutive flyouts. His fifth was one-two-three with two K’s; the first led off the inning and ended in a two-seam, and the second ended the inning on a four-seam. He allowed only four runners on base through his first five innings. He saw his worst jam in the sixth: two singles meant two runners on base in the same inning, who advanced a base on a groundout. He posted one more strikeout after that with a changeup, followed by a flyout to end the inning. His last K, the first out in the seventh right after the solo shot he gave up, was his last K of the day and his only called K. It ended in a two-seam. None of his strikeouts were achieved with only three pitches. Incidentally, Beckett can thank Youk for the last out of that inning. Beckett induced a ground ball, and Youk had to dive for it and had just enough time to make an off-balance throw to first that was still in time. Actually, believe it or not, Beckett almost lost. Since the solo shot occurred in the top of the seventh, he left down by one because we had failed to score up to that point. If it weren’t for that solo shot, not only would the game have been a shutout through seven, but as always in baseball, there’s no guarantee that we would have pulled it together in the bottom of the frame. Who knows? Maybe we would have had another supremely long scoreless marathon. Crawford struck out swinging to start the bottom of the inning. Clearly that was not promising. Reddick flew out to left, and already two outs were on the board. A quick note about Reddick. He’s clearly ready to assume the role of a starter. Since Drew is another model of consistency on the team, meaning of course that he’s consistently underproductive in every conceivable aspect of the game with the obvious exception of defense, it’s good to see Reddick get some regular playing time. That will increase his sample size, and if he can earn a starting job during the second half of the season in the middle of a run to the playoffs, I’d say he’s got it. Everyone knows it. Theo knows it, Tito knows it, and Drew knows it. One thing you have to admire about Drew, in addition to his defense, is that he’s a quiet guy. He doesn’t get cranky and complain after every single failed at-bat, which would be really bad for the clubhouse. If you had to have a guy on your team as consistently underproductive as Drew, Drew’s demeanor is perfectly suited for that role. Of course, it’s ironic to say that about Reddick after he went 0 for 4 last night, but of course that’s just one game. He almost got us on the board in the fourth; Papi doubled and moved to third on a single by Crawford, but Reddick’s fly ball wasn’t deep enough to allow him to score. He tagged up but was thrown out at home. Anyway, with two out in the inning, Tek singled. Scutaro doubled, which could have scored Tek had a fan not reached out and taken the ball out of play. In the end it didn’t matter because Ellsbury singled them both in. But still. You never know, so you should never do anything to affect the outcome of the ballgame (unless you’re on the team, and preferably unless it’s to affect it for the better). Then Seattle made a pitching change, and Pedroia singled to extend his hitting streak to twenty games. Then Seattle made a pitching change, and Gonzalez stepped up to bat. Pedroia stole second, Ellsbury scored on a wild pitch, and Pedroia moved to third on a throwing error. And Gonzalez ended up walking anyway. Youk ended the inning by grounding into a force out. Bard took the ball from Beckett and did not have a very good eighth. He loaded the bases with nobody out. He gave up a single and a four-pitch walk, and then a sac bunt turned into an infield hit. Luckily he was able to get the three outs after that, on one of which he was extremely lucky, because he missed his location on the deciding pitch of a strikeout. He ended up getting the strikeout, but as Beckett showed, we all know what happens when pitchers make mistakes. Paps’s ninth was much better: a single and steal followed by three outs. The final score was 3-1, and Beckett walked away a winner after all. An interesting stat to let you know why we shouldn’t be surprised: we have now outscored the opposition 93-33 in the seventh inning. I mean, it makes perfect sense. Either you’ve got a starter out there who’s exhausted or a reliever who hasn’t had a chance to find his rhythm yet. The Mariners shouldn’t be surprised either; they’ve now lost their last fourteen games, which sets a new club record. Last but most certainly not least, we doff our caps to Tito, who with last night’s game earned his 715th win as our manager and the thousandth win of his managerial career! Here’s to you, Tito. You gave us our first championship in eighty-six years in your first year here. You gave us another one in 2007. You made it through Manny Ramirez and other characters. And you’ve done it all with the utmost class. You’re one of the best ever. Congratulations!